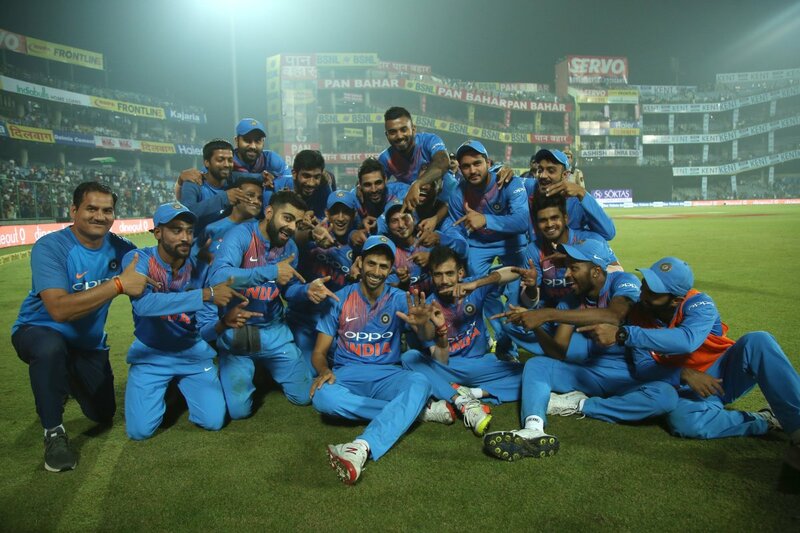 New Delhi, Nov 1: Veteran pacer Ashish Nehra could not have asked for a better send-off as India thrashed New Zealand by 53 runs at the Ferozshah Kotla here on Wednesday to bring up their maiden win against the Kiwis in T20 Internationals. 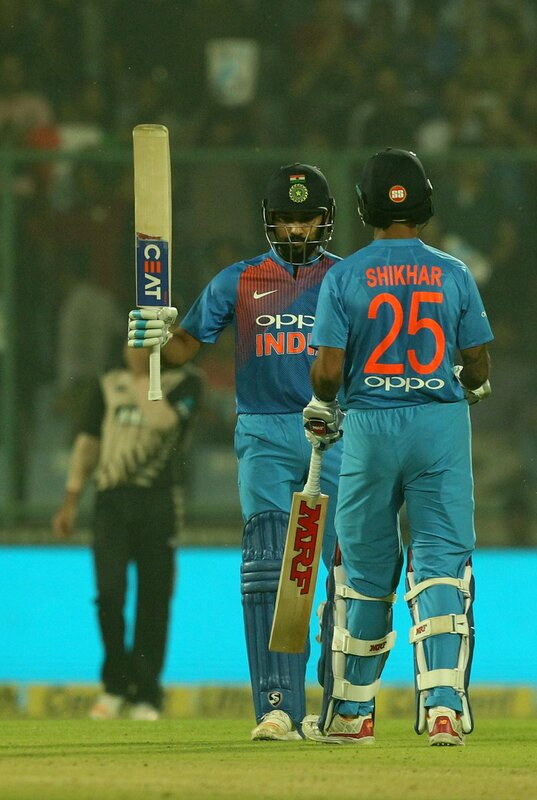 India's opening duo of Shikhar Dhawan (80 from 52 balls) and Rohit Sharma (80 from 55 balls) blasted identical half tons to set the tone with a 158-run record opening stand and guide the hosts post a massive 202/3. In reply, the tourists failed to get going as only five of their batsmen -- Kane Williamson (28), Tom Latham (39), Mitchell Santner (27), Ish Sodhi (11) and Tom Bruce (10) could manage to reach double figures. The Kiwis found both their openers -- Martin Guptill (4) and Colin Munro (7) back in the hut inside the first four overs with just 18 runs on the board. The credit for Guptill's dismissal went to Hardik Pandya's quick reflexes, latching on to a superb running catch at long-off off leg-spinner Yuzvendra Chahal. Munro failed to make full use of the life when he was dropped by Pandya off Ashish Nehra, and was beaten by a pacy yorker from Bhuvneshwar Kumar. Tottering at 33/2 by the end of the powerplay, the onus was on skipper Kane Williamson (28 off 24 balls) and Tom Latham to take out of troubled waters. Williamson, who started off by clobbering Bhuvneshwar for a six before enjoying a reprieve from Kohli at mid-off off Nehra, fell prey to Pandya's first delivery of the match, comfortably caught behind by Mahendra Singh Dhoni. The dismissal of Williamson brought in Tom Bruce (10 from 10b), who started off with a boundary off Pandya but fell immediately to left-arm spinner Axar Patel. One ball later, Axar dismissed Colin de Grandhomme (0) as the Kiwis found themselves tottering at a precarious 84/5 after 13 overs. They were soon reduced to 99/7 as the Indian bowlers tightened the noose. Chahal dealt the final nail on the coffin by dismissing New Zealand's last hope -- Latham, smartly stumped by Dhoni as the asking rate kept on mounting. Merely a formality with the Kiwis requiring 61 off the last over, Kohli threw the ball to Nehra for one last time in his 18-year-old international career. As Nehra went back to his run-up to bowl his fourth of the over, a young ball boy took everyone by surprise when he came up running to touch the veteran pacer's feet. Earlier, India made full use of the horrible fielding effort from the Kiwis to decimate the Kiwi bowlers. While Dhawan belted a 52-ball 80, to eclipse his previous highest T20I score of 60, Rohit continued his glorious form to smash a 55-ball 80, comprising six boundaries and four sixes. With the dew setting in, the New Zealanders found it tough to grip the ball, which was well utilised by the Indian duo, reaching 80/0 midway through the innings. Dhawan had by now reached his third T20 fifty with a single off an inside edge off left-arm spinner Mitchell Santner, who cramped him for room. The southpaw turned up the heat by smashing a couple of sixes even as Rohit got to his 12th T20I half century by clobbering Santner for a maximum and two consecutive boundaries as India's score crossed the 150-run mark in no time. Leg-spinner Ish Sodhi, who was till now at the receiving end of Dhawan's onslaught, got the better of the southpaw with a googly outside off. Dhawan's stay at the crease was ended when he failed to connect the ball and instead nicked back to stumper Latham. Two balls later, Sodhi packed the dangerous Pandya (0), who was promoted up to accelerate the scoring rate. With 3.2 overs left, skipper Virat Kohli (26 off 11 balls) walked into the middle amid loud cheers from the capacity crowd and began sending the bowlers to the leather hunt in the company of former skipper Dhoni, who was at 7 off two deliveries. 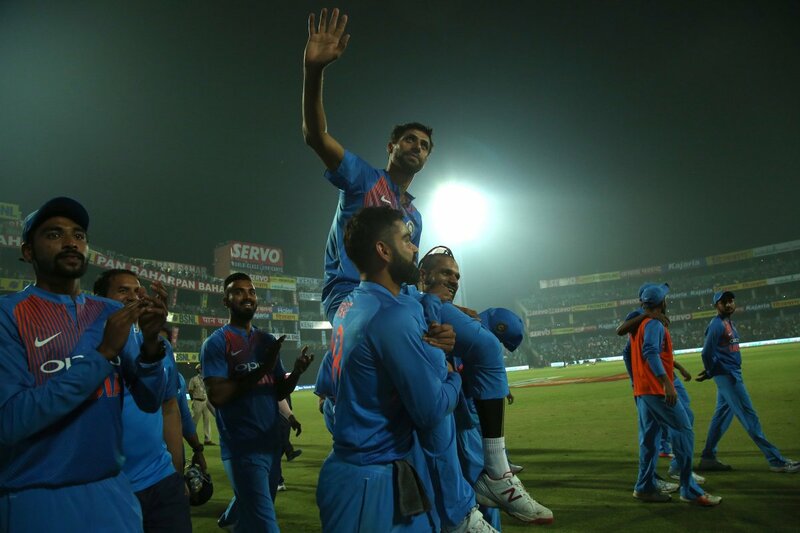 After the match, Nehra took a lap of honour around the ground with the entire team with him. His long-time Delhi team-mates Kohli and Dhawan hoisted him up on their shoulders as he waved energetically at the crowd. With the win, India have taken a 1-0 lead in the three-match rubber and will next face the Kiwis at Rajkot on Saturday.